Improved Jump Jets (iJJ) trade their lower weight and some of their vertical thrust for better horizontal acceleration, and much better control over both fuel consumption and jumping itself. Particularly advantageous is the ability to thrust sideways rather than only forwards and backwards. This greatly increases a mech's evasive capabilities, like jumping to cover or dodging missiles. 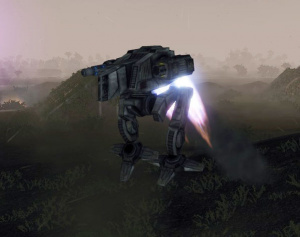 The heat generated by the use of either type of Jump Jets needs to be carefully considered in the overall management of a Mech's heat. For example, firing energy weapons mid-jump could result in a serious heat spike which could damage your Mech.